Methicillin-Resistant Staphylococcus Aureus (MRSA) is defined as a type of bacterial staph infection that is non-responsive to antibiotics normally prescribed to treat such infections. MRSA was first described in 1961-1962 in a patient whose infection was resistant to the drug Methicillin, which was discovered in 1960. The incidence of MRSA greatly increased in the United States in the 1980s and was especially emerging in patients who used intravenous drugs. The bacteria from which MRSA arises, staphylococcus aureus, is found in the skin and in the nostrils of one third of all people and do not show any symptoms of having been exposed to the bacteria. These carriers of the bacteria are then exposing the bacteria to all of the items that they touch as well as expelling it into the air where it will remain until the item is next cleaned. Typically, cases of HA-MRSA do not respond to methicillin or other antibiotic agents. However, majority of cases of CA-MRSA are susceptible to other antibiotics to rid of the bacteria. Lab results will lead the doctor to prescribe a specific antibiotic for each specific case if needed. Teicoplanin and vancomycin are two of the most common antibiotics used in treatment. In some cases, though, antibiotics are not necessary. Simply draining the wound/abscess will be sufficient treatment to prevent the spread of MRSA. Typically the broth test and agar test are the main tests for detecting MRSA, and the cefoxitin disk screen test can be used as a back-up test. • Detecting oxacillin/methicillin resistance can be difficult because of the presence of multiple populations (susceptible and resistant) may coexist within one culture of staphylococci. • Oxacillin and cefoxitin are tested instead of methicillin because methicillin isn’t as readily available in the US as it once was. Oxacillin detects subpopulations well and cefoxitin activates mecA gene better, making it a more accurate test than other using oxacillin. • Methicillin and oxacillin are in the same class of drugs. Methicillin has historically been the drug of choice for detecting resistance, hence the name MRSA. Even though the preferred drug of choice for testing has changed, the name had remained the same. According to Centers for Disease Control and Prevention, there are additional tests to detect oxacillin/methicillin resistance but the most common and reliable tests have been listed above. The bacteria Staphylococcus aureus lives on the skin of one third of the population who do not present with any symptoms. However, they still have the ability to spread the bacteria through touch and through the air, contaminating their surroundings without the knowledge of doing so. Most staph infections are then spread by skin-to-skin or equipment-to-skin contact. Healthcare workers' hands are at high risk for cross-infection in patients who develop or are exposed to HA-MRSA, making hand hygiene highly important in minimizing the risk of contracting the bacteria. Those who are at risk of acquiring HA-MRSA and CA-MRSA are listed above in the Characteristics/Clinical Presentation section. Please refer to the ‘Characteristics/Clinical Presentation’ section for more information on the associated signs and symptoms. A common practice to rid the body of MRSA infection is known as decolonization. The purpose of this treatment is to remove MRSA from the patients’ skin and nostrils with an intranasal ointment as well as an antimicrobial body wash. The patient must use these for five consecutive days to decrease further transmission and infection. However, 21% of patients undergoing this treatment will fail due to non-adherence. These patients are mainly under the care of a primary care physician in an outpatient clinic. Treatment is more likely to be successful in the hospital setting due to the nurses and cleaning staff managing the environment. If the treatment continues to fail after two attempts, the patient is deemed as “chronically colonized”. These patients will be treated only for risk assessment (i.e. during surgery) to prevent re-colonization.These patients must change their lifestyles by regularly cleaning their home, bedding, towels, and clothes. Some strands of MRSA (identified through blood work) have the ability to be treated through antibiotics. Teicoplanin, Vancomycin, and other antibiotics are often prescribed when the physician feels the infection will benefit from pharmacological intervention. Presently, the research is looking towards preventative strategies to decrease the incidence of MRSA in the healthcare settings. 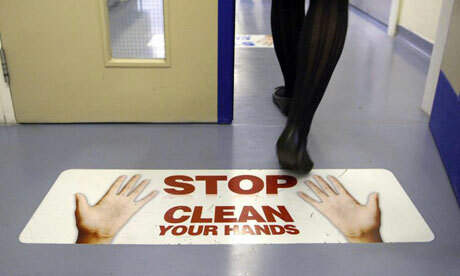 Nurses are the healthcare workers in most contact with the patients in the hospitals and therefore, can be cross-contaminating patients with MRSA bacteria if there hand hygiene is deficient. In some areas, hand-washing rate in nurses has found to be as low as 13-20% from patient to patient. Chun et al. demonstrates that proper hand hygiene during nursing care can directly reduce the number of infections in the hospital setting. For example, a hospital’s MRSA acquisition rate decreased from 13.3 per 1,000 patients to 2.0 per 1,000 patients simply by changing their hand-washing criteria for the nursing staff. Hand hygiene is the easiest, cost-effective way to decrease the infection rate of our patients in the healthcare settings. Note how to properly apply each product, how long it needs to be left on the surface, if the surface needs to be rinsed prior, if it’s only for specific surfaces, etc. There has also been evidence to support the use of low-frequency ultrasound on bacteria, including MRSA. According to an article posted in 2010, low-frequency ultrasound delivered at 35 kHz reduced colony forming units of bacteria and alters colonial characteristics of MRSA. Further screening should be done to rule out such diseases. Hörner A, Hörner R, Salla A, Nunes M, Garzon L, Rampelotto R et al. Staphylococcal scalded skin syndrome in a premature newborn caused by methicillin-resistant Staphylococcus aureus: case report. Sao Paulo Med J. 2015;133(5):450-453. Braich P, Aggarwal S, Mukhtar, BA S, Almeida D. Nosocomial keratitis caused by methicillin-resistant Staphylococcus aureus : case report and preventative measures. Journal of Community Hospital Internal Medicine Perspectives. 2015;5(5). ↑ 1.0 1.1 1.2 1.3 1.4 1.5 1.6 Mayo Clinic Staff. MRSA infection - Mayo Clinic [Internet]. Mayoclinic.org. 2016.http://www.mayoclinic.org/diseases-conditions/mrsa/basics/definition/con-20024479 (accessed 1 April 2016). ↑ 2.0 2.1 2.2 2.3 2.4 2.5 2.6 2.7 Millar B, Loughrey A, Elborn J, Moore J. Proposed definitions of community-associated meticillin-resistant Staphylococcus aureus (CA-MRSA). Journal of Hospital Infection. 2007;67(2):109-113. http://eds.b.ebscohost.com.libproxy.bellarmine.edu/ehost/detail/detail?vid=14&sid=71ee6b7e-199d-4adc-8e31-bc94eca59a09%40sessionmgr113&hid=112&bdata=JmxvZ2luLmFzcCZzaXRlPWVob3N0LWxpdmUmc2NvcGU9c2l0ZQ%3d%3d#AN=105828672&db=cin20 (accessed 2 April 2016). ↑ 3.0 3.1 3.2 Skov R, Gudlaugsson O, Hardardottir H, Harthug S, Jakobsen T, Jørn Kolmos H et al. Proposal for common Nordic epidemiological terms and definitions for methicillin-resistant Staphylococcus aureus (MRSA). Scandinavian Journal of Infectious Diseases. 2008;40(6-7):495-502. http://eds.b.ebscohost.com.libproxy.bellarmine.edu/ehost/detail/detail?vid=12&sid=71ee6b7e-199d-4adc-8e31-bc94eca59a09%40sessionmgr113&hid=112&bdata=JmxvZ2luLmFzcCZzaXRlPWVob3N0LWxpdmUmc2NvcGU9c2l0ZQ%3d%3d#AN=105649710&db=cin20 (accessed 2 April 2016). ↑ 4.0 4.1 4.2 4.3 4.4 Robinson J, Edgley A, Morrell J. MRSA care in the community: why patient education matters. British Journal of Community Nursing. 2014;19(9):436-441. http://dx.doi.org.libproxy.bellarmine.edu/10.12968/bjcn.2014.19.9.436&nbsp; (accessed 2 April 2016). ↑ Centers for Disease Control and Prevention. MRSA Tracking. http://www.cdc.gov/mrsa/tracking/index.html (accessed 7 April 2016). ↑ 6.0 6.1 6.2 6.3 6.4 MedlinePlus Medical Encyclopedia. MRSA. https://www.nlm.nih.gov/medlineplus/ency/article/007261.htm (accessed 7 April 2016). ↑ Huang S, Hinrichsen V, Datta R, Spurchise L, Miroshnik I, Nelson K et al. Methicillin-Resistant Staphylococcus aureus Infection and Hospitalization in High-Risk Patients in the Year following Detection. PLoS ONE. 2011;6(9):e24340. http://journals.plos.org/plosone/article/asset?id=10.1371%2Fjournal.pone.0024340.PDF (accessed 8 April 2016). ↑ Datta R, Huang S. Risk of Infection and Death due to Methicillin‐Resistant Staphylococcus aureus in Long‐Term Carriers. Clinical Infectious Diseases. 2008;47(2):176-181. http://cid.oxfordjournals.org/content/47/2/176.full.pdf+html (accessed 8 April 2016). ↑ 9.0 9.1 Choi H, Park K, Park S, Jun B, Lee D, Yeo S. The appropriate medical management of methicillin-resistant Staphylococcus aureus in chronic suppurative otitis media. Acta Oto-Laryngologica. 2010;130(1):42-46. http://dx.doi.org.libproxy.bellarmine.edu/10.3109/00016480902870522&nbsp; (accessed 2 April 2016). ↑ Centers for Disease Control and Prevention. Laboratory Testing for MRSA. http://www.cdc.gov/mrsa/lab/ (accessed 8 April 2016). ↑ 11.0 11.1 11.2 Chun H, Kim K, Park H. Effects of hand hygiene education and individual feedback on hand hygiene behaviour, MRSA acquisition rate and MRSA colonization pressure among intensive care unit nurses. International Journal of Nursing Practice. 2014;21(6):709-715. ↑ Centers for Disease Control and Prevention. Cleaning & Disinfecting Athlete Facilities. http://www.cdc.gov/mrsa/community/environment/athletic-facilities.html (accessed 8 April 2016). ↑ Centers for Disease Control and Prevention. Laundry. http://www.cdc.gov/mrsa/community/environment/laundry.html (accessed 8 April 2016). ↑ Conner-Kerr T, Alston G, Stovall A, Vernon T, Winter D, Meixner J et al. The Effects of Low-frequency Ultrasound (35kHz) on Methicillin-resistant Staphylococcus aureus (MRSA) in vitro. Ostomy Wound Manage. 2010;56(5):32–42. http://www.o-wm.com/content/effects-low-frequency-ultrasound-35-khz-methicillin-resistant-staphylococcus-aureus-mrsa-vit (accessed 9 April 2016). ↑ Staphylococcus Aureus Infection Differential Diagnoses [Internet]. Emedicine.medscape.com. 2016.&nbsp;http://emedicine.medscape.com/article/971358-differential (accessed 6 April 2016).